Thankfully, stomach cancer is rare. But here are 7 potential warning signs that warrant a trip to your doctor for further evaluation. Though we all get stomachaches from time to time, pain isn’t typically an early symptom of stomach cancer. So what should you be on the lookout for instead? Here’s the lowdown on stomach cancer, according to general surgeon Kevin El-Hayek, MD, FACS. Early stomach cancer symptoms are typically so unremarkable that they go completely unnoticed. 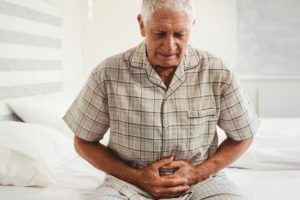 Stomach cancer is one of those tricky diagnoses where most people may have retrospectively felt symptoms, but they’re usually vague symptoms that can be confused with many other benign gastrointestinal (GI) disorders. A general feeling of discomfort. Because these symptoms tend to be dismissed as normal GI issues — and they are for most people — when stomach cancer is finally diagnosed, it’s often in the advanced stages. You’re seriously fatigued. Dr. El-Hayek says this could be from a slow blood loss which, coupled with unexpected weight loss, can be a sign of cancer. Blood loss can also lead to anemia, a low red blood cell count, that’s likely the source of your exhaustion. You have blood in your stool or vomit. This is much less common, but it can happen if you’re losing a lot of blood. You feel full, even after you’ve only eaten a small amount. Your bowel habits have changed. Maybe you’re experiencing recurrent bouts of diarrhea or constipation that are out of the ordinary. Gastrointestinal symptoms that don’t go away. For example, you’ve had nausea or abdominal discomfort that lasts for more than a couple days. You have GI symptoms that you haven’t experienced before. Reflux — when the contents of your stomach come back up into your esophagus — is a good example. “These are all signs that you should probably go see your primary care doctor to see if you warrant further testing,” advises Dr. El-Hayek. Most of the time, these symptoms are caused by something else, but it’s best to get them checked out so that if you do need treatment, you can get it as soon as possible. The main reason for the decrease in cases is probably that infections from Helicobacter pylori, a type of bacteria known more commonly as H. pylori, are being diagnosed earlier than they used to be, Dr. El-Hayek notes. H. pylori is believed to be one of the major causes of stomach cancer because it can cause chronic inflammation in your stomach lining, as well as ulcers. “Now that we’re making the diagnosis of H. pylori earlier when patients get symptoms, they’re treated with antibiotics, the infection is eradicated and the overall risk of stomach cancer is presumably decreased,” Dr. El-Hayek says. Although H. pylori infections are extremely common, many people don’t ever have any symptoms. “For those who do get symptoms, it’s normally this dull, achy pain after eating,” says Dr. El-Hayek. You might also notice nausea, bloating, burping, weight loss and lack of appetite. If you experience any of these, Dr. El-Hayek recommends that you see your doctor for testing. What are risk factors for stomach cancer? Age (your risk goes up as you get older). Previous stomach surgery for ulcers. A diet high in smoked foods, salted fish and cure meats. Don’t panic if your gastrointestinal system seems to be acting weird. “Most of the time, GI symptoms are not from stomach cancer — they have benign causes. Our gastrointestinal systems are quite fickle sometimes,” Dr. El-Hayek says. Why Does Heartburn Get Worse as You Age?